Ever since the Double Fine Adventure Kickstarter, I've come to support a different number of Kickstarter projects over the past year. One of the quirkier ones was for the Trial of the Clone book, which was meant to be sort of an RPG turned into a book with a Choose Your Own Adventure sort of feel to it. Add in the fact that the book was created by Zach Weiner, the man behind the webcomic Saturday Morning Breakfast Cereal (SMBC), and I was all over it. The project was pretty successful and managed to raise over $130,000 for it's $15,000 goal, which is pretty cool indeed. And over time, I was surprised to find out that the book had been adapted into sort of a game app that was available for the Android platform. Now admittedly I had my ebook copy of the book for some time now, but just never got around to reading / playing it for one reason or another. Seriously, I have a LOT of books in my reading queue. So it was nice to see that that someone had turned it into a game since it gave me more options. And then the app went half-off on the Google Play Store and you can sort of figure out what happened next. 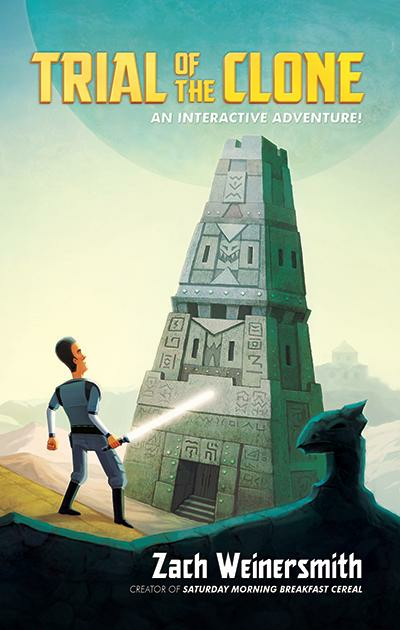 Synopsis: Trial of the Clone is somewhere between a game app and an ebook. So it's an interactive ebook with choosable narrative paths and a character sheet? Plus Wil Wheaton? Wait - I'm getting ahead of myself here. Oh, and as mentioned the original book was written by Zach Weiner while the app was developed by Tin Man Games. The story behind this game of sorts centers around YOU, as the protagonist. In this case, you are yet another clone from a large batch of them and thus it's up to you to determine your fate. This premise sort of makes sense given how often it is possible for you to die, and thus the desire to be able to re-spawn and create a new character over and over again. The story borrows from a lot of popular science fiction, thus you will realize that it shares many elements with franchises like Star Wars and Star Trek. Just look at the cover image above - that's you as the clone but no, you're not officially holding a lightsaber. It's something completely different given, well, a lightsaber is a licensed property. Go figure. The humor of Zach Weiner utilized in the book is definitely a little quirky and may not be appreciated by most folks. It's sort of like a geekier brand of Mel Brooks humor, which means that jokes and puns will either make you laugh or perhaps groan in annoyance. I have to admit that I love this style of humor, much to my partner's discomfort at times. Go figure. The app is a nice translation of the entire Choose Your Own Adventure sort of experience. This is best evidenced by the option to leave bookmarks at key decision points in the same way one would leave his or her finger in the book, zoom ahead to see if you die, then go back to that finger-point in order to try the other path. Thus the book sort of allows you to "save" your progress. Or you can call it cheating. What sets the book apart from the traditional Choose Your Own Adventure path is the fact that you do have an actual character sheet and will need to roll dice. But in this case, the app has a random number generator presented as a slot machine wheel that can give you a result from 0-3 that is added to your stat. And yes, you have stats like Wits, Charisma and Fighting. And your stats can increase over time given your choices in the game. And you have a fixed set of life points since it's very possible for you to die due to combat and not just the death pages in the book. In this regard, the app is pretty smooth and it makes going through the story rather easy. It keeps track of your stats and inventory items for you and allows for smooth navigation through the different page elements. And since Wil Wheaton read for the audio book version of this story, his narrations are part of this game as well and you have the option to turn them on or off based on your preferences. I don't know how long the Trial of the Clone app will be on sale at the Google Play Store, but it's definitely worth picking up if you like punny science fiction humor or just miss Choose Your Own Adventure games. This hyrid between an ebook and a game does make for a fun experience and I'm enjoying going through the different story outcomes over and over again. Plus there are in-game achievements based on your ability to find all the possible narrative paths. The game rates a good 4 celibate monks out of 5. And if you like this game, there's still a few days left in the Kickstarter project for the sequel, which ends on June 7.